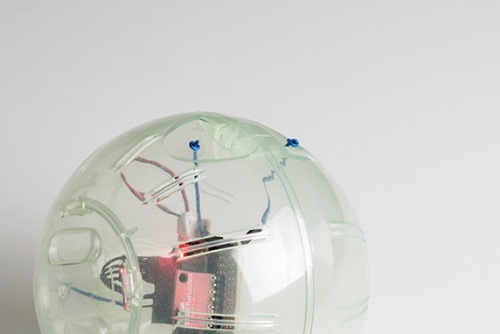 How a hamster ball and Blynk app can detect not only motion, but perhaps something paranormal? Hello again, SparkFun community! Recently, as I've been continuing my trek into uncovering the realm of the unknown, I've been thinking about how to detect if paranormal events are happening when you are not present in a space while conducting an investigation. As these occurrences are subjective experiences, it makes it rather hard to validate the claims that something is actually happening. It escapes all logic, becomes irreproducible and, among the scientific community, can turn into an amusing story at best. Before you ask me, I'm just going to come out and say it. Yes, that is, in fact, a hamster ball you see there. I actually picked this baby up on Amazon for just a few bucks. I was intrigued mostly because it glowed in the dark, but it seemed like the perfect enclosure for the small amount of electronics I was going to implement. In the future, I do plan on creating a neat little 3D-printed version of it. Minus the enclosure, the following list was all I really needed to implement my idea and suspend the electronics inside the center of the ball. There are three main components that make up the ComSphere aside from the enclosure itself: (1) SparkFun ESP8266 Thing, (2) SparkFun Triple Axis Accelerometer Breakout - ADXL345 and (3) a Lithium Ion Battery. Small holes were drilled into the sides of the sphere where the three grooves on each hemisphere reside. This allowed me to tie a small wire going from the outside of the ball to the protoboard inside without interfering with the ball's rolling movement. 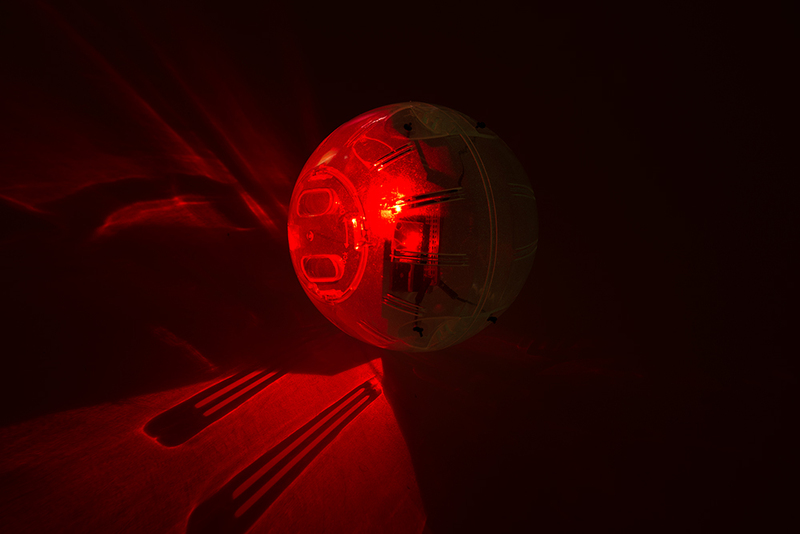 After the build I realized it actually wasn't really necessary to have a phosphorescent ball because the sphere itself looked pretty awesome with the red LED from the Thing glowing. Next step would be to create a proper 3D-printed enclosure for it. The SparkFun ESP8266 Thing is a breakout and development board for the ESP8266 WiFi SoC, integrating Internet of Things (IoT) or WiFi-related projects capable of utilizing the Arduino IDE. This project utilizes the capabilities of the Thing through programming WiFi access to either your home, business or mobile hub internet. For my investigation, I programmed my Thing with both the user name and password associated with my wireless hub. So now, how do I know if the ball has moved? Well, that's where one of my favorite little apps comes in handy: Blynk. 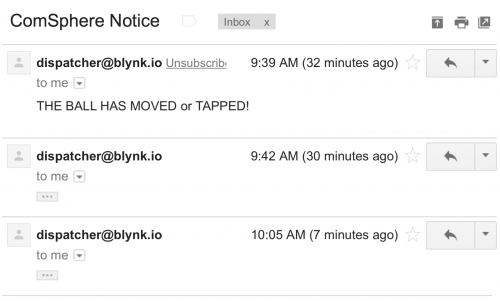 I had an old smartphone lying around and installed the Blynk app (Android/iPhone) to handle communication between my ComSphere and the outside world. The ADXL345 Accelerometer handles the monitoring of motion and even has tap/double tap detection. So if someone or something moves the ComSphere, not only will it notify my phone, but an email will be sent to my account. I'm not going to lie; I spent about 15 minutes in my office spinning the ComSphere and watching the video playback in slow motion. I had to share that with you before I left. Have fun exploring other applications you could use with this setup, and please share your ideas in the comments below! 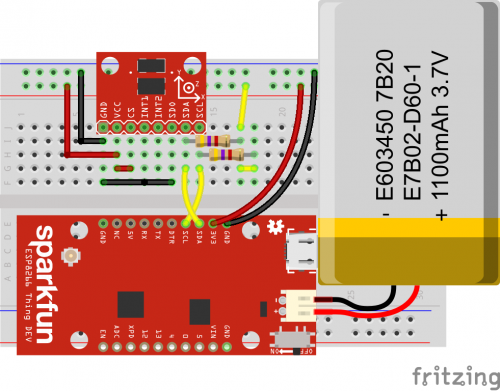 An overview of SparkFun's ESP8266 Thing - a development board for the Internet of...Things. This tutorial explains the circuitry driving the board, and how to get it up and running in an Arduino environment. Get started with the ADXL345 Accelerometer. Is there ANY way you can build me a Comsphere and ship it to me please!? I will gladly pay whatever the cost via PayPal to you! Elizabeth Saint is my new favorite person on tv.. anyway, just to add my 2cents.. for an upgraded model I'd look into incorporating 1 a micro camera that either activates on motion, or - just records onto a removable sd card that somebody can playback later. If you already have an app that alerts what time the ball moved, then someone can go back and pinpoint that time. Toy drones use cheap, tiny, hd cameras for flight. Using one of those to fit into your design would probably be easy for someone with ur background. Sup from Jersey btw..
Yay to my home state! Kevin - you rock! Thank you so much for the comment and support. Absolutely love the idea and thought about implementing something along those lines. 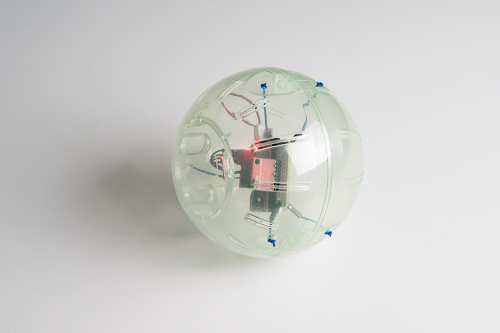 I think at that point it will definitely require an upgrade from the hamster ball to my own 3D printed enclosure. Cool concept. You can experiment with different types of sensors too. Everything weird that happens when no one's around can be explained by the presence of one or more invisible (to us) cats. Put a dummy hamster or mouse (or a cat treat) into the ball to verify this.